From this point on, all posts were drafted either later in the trip or once I returned home. For a great portion of the trip I couldn’t really bring myself to type for fear of missing out (FOMO I believe its called). This paragraph was written while flying from Queenstown to Sydney on January 22nd while listening to Migrations, the new album by Bonobo. One of my favorite electronic music artists, and I marked my calendar and purchased it the day it came out. The other soundtrack to my trip thus far is the Moana soundtrack. I saw the film before the trip and absolutely loved it. I can relate to the struggle of finding balance between your place at home and the internal voice that calls you to sea, to discover new places. The film also features quite a bit of Polynesian/Maori mythology and culture. So picture me dressed up to see patients, walking 15 minutes to eye clinic in Rotorua listening to Moana. I found a little shortcut that crossed over a very beautiful section of Fairy Springs. 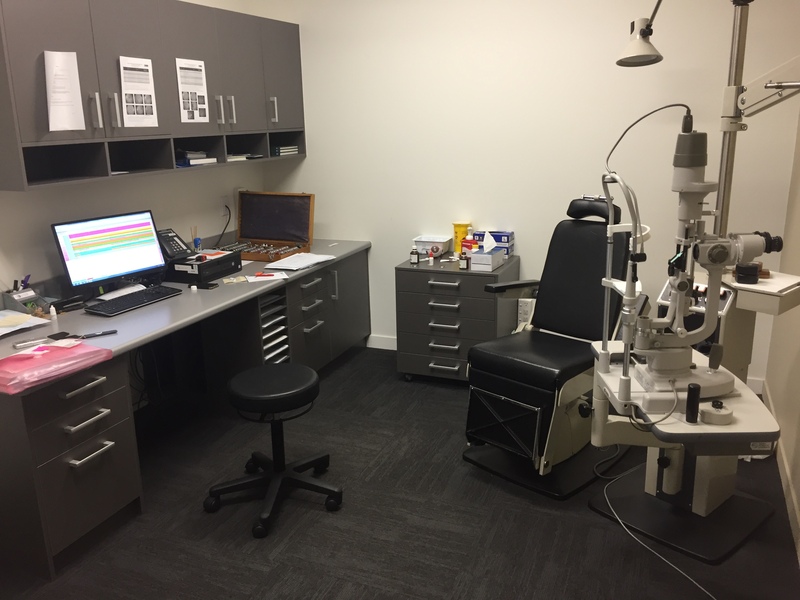 Three ophthalmologists and a rotating registrar (resident) work at the Rotorua Eye Clinic along with a wonderful staff of secretaries and nurses. I spent the majority of time working with the registrar, TK. Like in Kenya, students start medical school directly after high school rather than completing an undergraduate degree. However, medical school is 6 years vs 4 years for us in the USA. After medical school, TK spent 2 years as a house officer, sort of doing the general medicine work that I am doing now. Then he spent a year doing research, which is basically required for ophthalmology since it is a competitive field. Then he undergoes 4 years of ophthalmology training (3 for me), likely followed by fellowship. At this point, I was typing from Honiara in the Solomon Islands a week later. I wasn’t kidding about wanting to experience the moments without spending too much time on the computer. However, on a day when I’ve already spent time in theatre and clinic and spent time playing music with the kids in my neighborhood, and when without internet or other distractions….I found some time finally. Back to New Zealand. Let’s talk about healthcare in New Zealand for a little bit. There is universal coverage by the public system. However, you can opt out and select private insurance. One or the other. Simple. One of the other interesting facets of healthcare in New Zealand is ACC insurance. This insurance covers any accident. Even I would be covered as a visitor. This lowered my threshold for doing somewhat dangerous activities, but to be honest I was going to mountain bike anyway. The big picture is to imagine the time and money spent on litigation like we do in the USA. Quite incredible. Also New Zealand government (aka taxpayers) paid for the Regional Eye Centre in Honiara. Not sure how many kiwis know about the extraordinary difference they have made in the Solomon Islands. I was also struck by public health efforts. The region has minor earthquakes on nearly a daily basis, and has had a few disastrous quakes recently. It was eye-opening to see billboards as far inland as Rotorua with advice for tsunami safety, instructing people to move to high ground as soon as possible if near the coast and a long or strong earthquake is felt. And think twice before you smoke in New Zealand. The packaging has grotesque images and vivid details in English and Maori about the many health consequences. For example, one package in bold letters reads “SMOKING CAUSES MOUTH CANCER” and show one of the nastiest looking mouths I’ve seen. Well done, New Zealand. And another topic. Guns. I’m going to get on my political horse for just a second and say guns are a problem in the USA. Not enough has been done to change policy concerning how easy it is to get guns in the USA, especially for people who have mental illness which is undertreated. If I had internet access right now, I would cite statistics about how significantly higher gun crime and mass homicide is in the USA vs other countries. In New Zealand, there are practically no guns. No guns. Even the police don’t carry guns – they only carry nonlethal weapons. If needed a gun may be found in a locked compartment in their car. Some kiwis have sporting rifles, but have to undergo strict screening. In light of all the controversial police killings of unarmed people it would be nice if we could at least make a few small steps toward clearing guns from our neighborhoods. End of that rant. Back to eye clinic – I only saw patients in the public healthcare system. The majority of these patients were Maori. Similar to Native Americans in the United States, the native people were subjugated to colonization by a foreign power, and today largely live at a lower socioeconomic status than white kiwis. However, from my perspective there has been a lot more effort to give back and honor the first people who came to Aotearoa. There is even a government initiative to pronounce Maori names of places correctly, which I learned is a difficult task as different tribes have different pronunciations. All the same, the white kiwi is very much in tune with the Maori. On the surface, one will find Maori designed tattoos and jade necklaces. But as I spent more time in Rotorua I learned it truly reflects a deep respect and compassion for the culture. Unfortunately, similar to Native Americans, diabetes is particular rampant among this group. It is a mix of genetic predisposition paired low income and topped with a heap of fast food restaurants across the street. In fact, according to a pamphlet I found, there are more than 4,000 people with diabetes just in Rotorua. Diabetic retinopathy, or vision loss from diabetes damage to nerves in the back of the eye, is almost guaranteed if diabetes remains uncontrolled for long enough. A little bit about ophthalmology, which is fascinating and intriguing to me but I understand this paragraph may be dry to the casual reader. Cataract procedures are the most common surgery performed worldwide. A cataract is hardening and opacification of the lens which occurs to a certain extent in all older individuals. It can also occur in children. The common procedure involves removing the old lens, and placing a new synthetic lens inside the eye. In New Zealand, this procedure is free if you meet objective and subjective criteria that establish vision impairment that will likely be improved by the procedure. If accepted, patients are placed on a list and will likely have the surgery performed within 6 months. 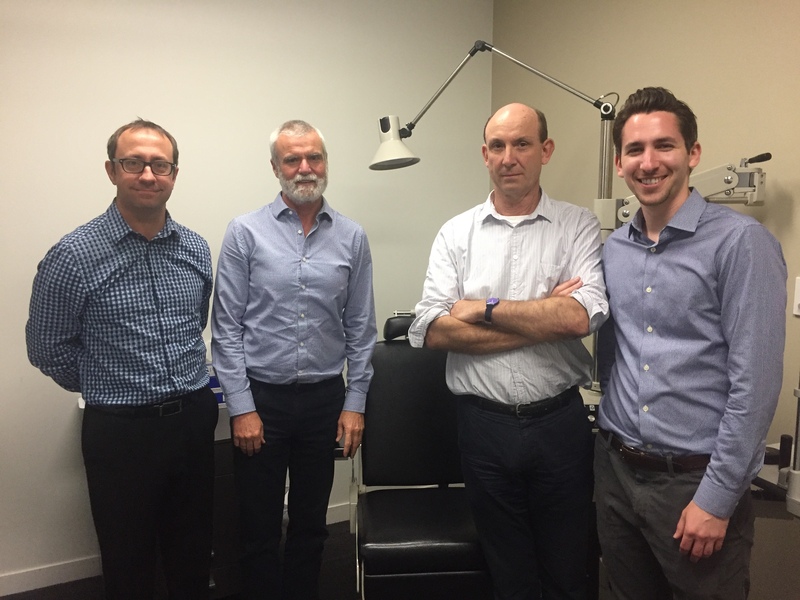 If not accepted due to a subthreshold “CPAC Score” unacceptable for publicly-funded surgery, the patient would be discharged to regular optometry follow-up, with re-referral welcome if the vision continues to worsen. I saw quite a few on these procedures in the operating theatre. There is a somewhat major difference in how it is done in first world countries vs third world countries. In the USA and New Zealand, the common procedure is phacoemulsification. A small incision is made at the limbus, which is where the cornea (the clear front of the eye) meets the sclera (the white of the eye). The patient’s cataract is broken up with high frequency sound waves and suctioned out. Then a flexible artificial lens is injected into the anterior chamber of the eye where is unfolds. In third world countries such as the Solomon Islands, a technique was developed which is much more cheap and quick. It involves a larger incision, and the cataract is removed intact with a ring-shaped hook. Then a rigid artificial lens is passed into the chamber. The procedures have similar success and complication rates, with the cheaper procedure having slightly more postoperative discomfort and bleeding. For me personally, I enjoyed the opportunity to practice using a slit-lamp, called such because a narrow slit of light is used to view the eye under magnification. They say the eyes are a window to one’s soul. You certainly can tell a lot about a person by looking at their eyes – it’s the only way to see blood vessels in detail noninvasively. This gives information about blood pressure control and sugar control in diabetes. These are risk factors for life-threatening cardiovascular disease. You can also directly see the brain. The optic nerves, which can be seen as they enter the retina in the back of the eye, are a direct extension of the brain. An important screening for patients with headaches, vision changes, dizziness, or nausea is to examine the optic nerves heads for papilledema or swelling. This is associated with hydrocephalus or increased intracranial pressure and is often due to a tumor blocking the circulation of cerebrospinal fluid. Back to non-eye things. I brought some literature with me to learn about the Maori. The first book I read was Maori Religion and Mythology by Edward Shortland, originally published in 1882. I am awestruck by the author’s recognition of the importance of documenting the culture which till that point had very little recorded in writing. The religion upholds an immortality of the soul, where deceased ancestors continue to watch the living and are to be revered and feared. The origin of native customs was taught by Tiki, the progenitor of the human race. The mythology personified and deified powers of nature and represented them as ancestors of all mankind. Being that the book was written in the 19th century, it is no surprise that there are lines which are strikingly condescending and not considered appropriate today. One is “There is a notable mental condition of the Polynesian to which we desire to direct attention. The Maori has a very limited notion of the abstract. All his ideas take naturally a concrete form. This inaptitude to conceive any abstract notions was, it is believed, the early mental condition of man.” I may be naïve, but I do believe time, love, and fear are all abstract concepts deeply understood by all populations. I think it was a common error to perceive different as inferior, and can only presume that the action of seizing land and subjugating another race also reflects an early mental condition of man. There are interesting details about the beliefs concerning disease and medicine. Tapu is a belief that certain things are holy and others are impure, and that one can be blessed or cursed depending on the circumstances of one’s actions. In disease, a spirit has taken possession of the body of the sufferer. Any action purposeful or accidental which angers the Atua, or family spirit leader, will cause an infant spirit to be sent to feed on part of the body. Infant, because they tend to be mischievous and haven’t been around long enough to form attachments to living relatives and are therefore less likely to show mercy. A person with disease must consult a matakite (seer) and a tohunga (religious leader) to discover the nature of their transgression and get advice to seek a cure. There is special mention of the process for curing porangi (insanity). The tohunga and the patient go to a river. Then the tohunga strips off his clothes, takes an obsidian flint, and cuts a lock of hair from the patient then himself. He breathes on the flint, smashes it with a stone, then tie the locks of hair together with a plant shoot. He then dives into the river and releases the locks. When they surface he recites a karakia, a section of which includes the following: “Unravel the tangle, Unravel, untie, Take away the fault from the head Of the Atua who afflicts this man. Take away the disease, And the mana of the curser.” To my westernized head, there is no scientific explanation of how this could cure mental illness. Though as I have not tried it, I cannot say it doesn’t work. I do think if I were ill and I saw someone take the time to cut off their own hair, jump in a river, and chant a prayer for me – I would feel a bit better. The foreigners were called pakeha by the Maori. They were at first readily admitted by the Maori to live among them. They were welcomed into the communities and formed families. They were revered and called matua (fathers). However, it did not take long for dissension regarding property ownership to arise, and the the foreigners were no longer called matua, but rather had the title tangata ke, strangers. I am thankful to have been treated as a welcome guest rather than a stranger by all the Maori I met in the eye clinic. The other book I read was Legends of Rotorua by A.W. Reed. This book was published in 1958. I will recount a few excerpts from my favorite Maori stories. Legend has it that the moon dies each cycle, but is reborn each cycle in the healing springs of Rotorua, called the Wai-ora-a-Tane. 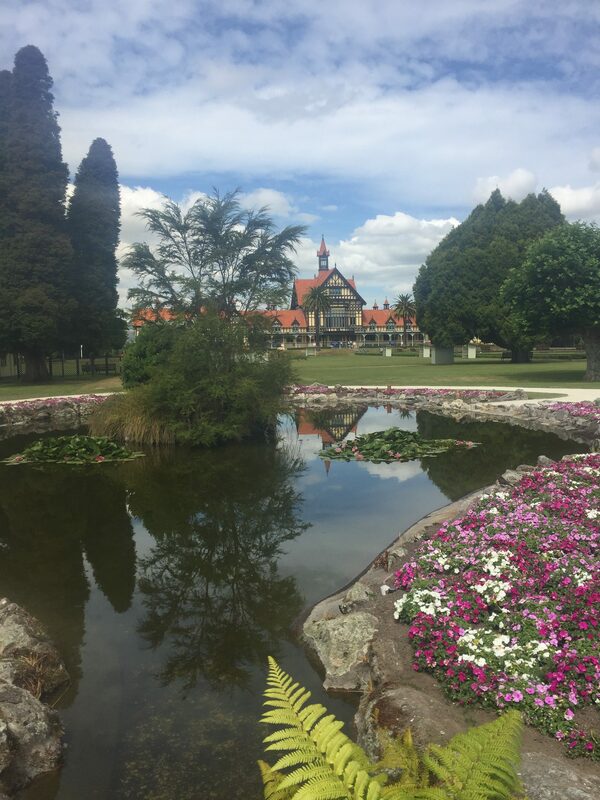 The hot springs in Rotorua, originally a burial site for the bones of Arawa chiefs, became known as the Government Spa and is currently the Polynesian Spa. 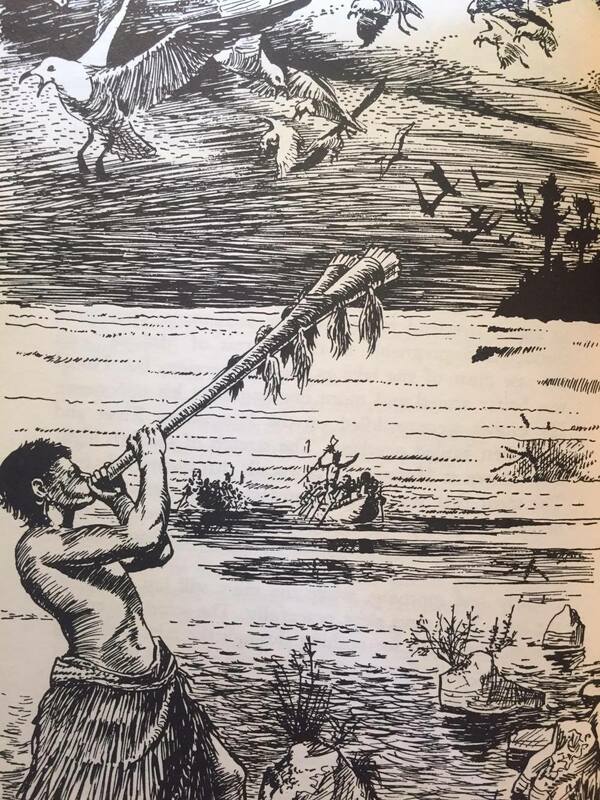 Fortunately, the bones were buried kia ngaro tonutia – “utterly and forever concealed”, as enemy raiders would have desecrated the bones by turning them into musical instruments if they were discovered. The most famous of the natural springs was visited by Father Mahoney, a Roman Catholic Priest in 1865. He was crippled with rheumatism and was completely cured after bathing for a week in the healing waters. Such was the fame of the spring that it has since been known as the Priest’s Bath. Some of the names of the other springs and geysers have more interesting Maori lore. The Brainpot is a geyser named after Te Tukutuku, a Maori chief who was discovered by his enemies after two years of hiding and had the misfortune of having his brain boiled in said geyser. The most prized stone of the Maori is the jade greenstone or Pounamu, which is a personification of the stone. The Pounamu people had a long fight with Tutunui, the guardian of fish. Tutunui had an alliance with the Sandstone people who were victorious in the fight. Thus the Greenstone people were forced to hide themselves in a waterfall in the Arahura River, where they remained as a source of the precious stone for Maori craftsmen. 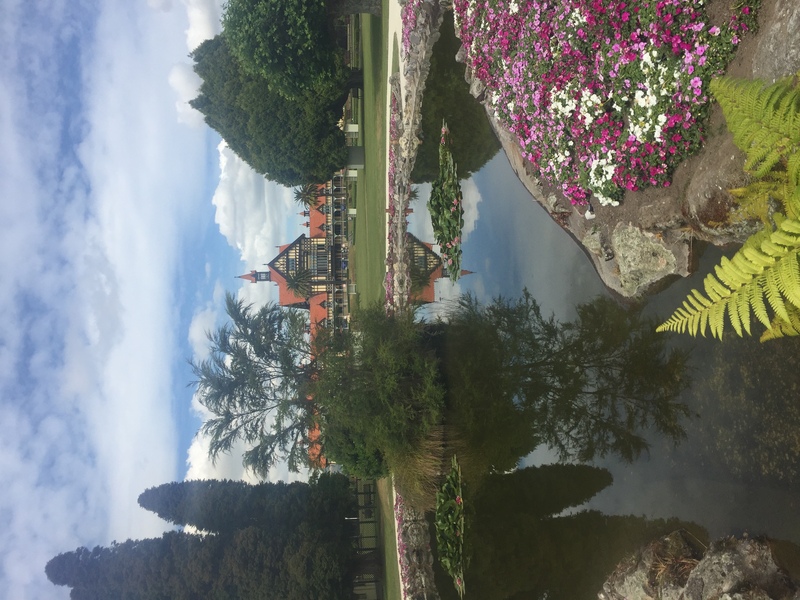 The place where I stayed and where the eye clinic is located is Fairy Springs, just 10 minutes northwest of Rotorua along the lake. The Maori name is Puna-a-Tuhoe, named for a tribe known as “People of the Mist”. Fairies to the Maori were not small playful spirits. Rather they were gods of war, who showed paths to victory by the flaming trails of meteor showers. They plunged in the waters of Fairy Springs after their deadly errands. As I crossed the springs every day while walking to and from clinic, I noticed the same family of ducks enjoying the peaceful shade of the stream. I stayed in an AirBnb for my week in Rotorua. My hostess, Candace, was Maori and she was absolutely wonderful in recommending things to do in town. In addition to hosting the AirBnb, she also sold Pokemon cards professionally, and thus there were binders full of Pokemon cards all over. I have been a fan for many years and was intrigued by my good fortune. I did quite a bit of adventuring in the evenings after clinic. 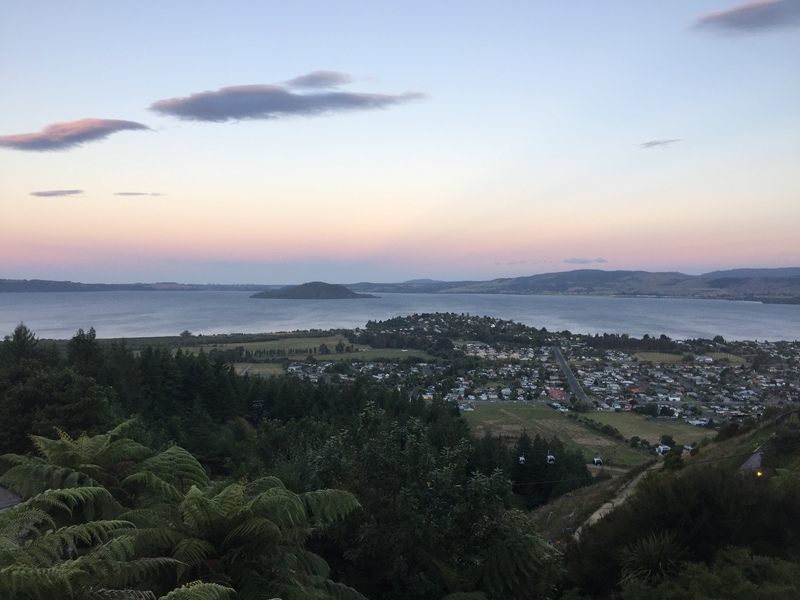 Monday night, I took the Skyline Gondola up to the top of a mountain and saw a beautiful view of Lake Rotorua and Mokoia Island. I enjoyed a few rounds of luge, which is like riding a go-cart with bicycle handles and all you can do is steer and brake as you pick up tremendous speed on the downhill course. As I waited in line, I was surrounded by families, groups of friends, and couples, many of them kiwis and aussies on vacation. That is when I felt the one of the first of many pangs of loneliness. I wished I had my family or someone close with whom to share the experience. I no longer had a host family to keep me company and distract me. That night, I signed up for a stargazing tour. Through the telescope, I could see nebulas and the milky way up close. I saw many constellations I had never seen before, most memorably the Southern Cross. I learned how to navigate toward the south pole using the tail of the Southern Cross as a guide. Orion was strangely upside-down. I had a spectacular view of the moon up close. Then clouds came in and I rode the gondola back down alone in the dark quiet. 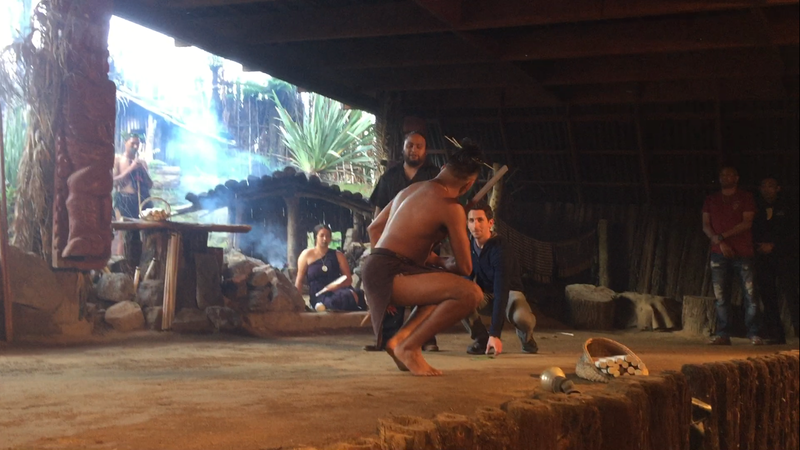 After clinic the following evening, I went to Mitai Maori Village for a meal and welcoming ceremony. The Village was founded by Wetini Mitai, who made his life’s mission to preserve his Maori culture, and had particular knowledge of Maori weaponry, song, and dance. His dance group, Te Marae won multiple dance competitions and Mitai was the Best Male Kapa Haka Leader 4 times over a period of 30 years. The haka is the famous Maori war dance. The All Blacks, the men’s rugby team, perform a Haka before their matches, and that is how most people have come to know the haka. A common part of the dance features wide open eyes and protruding tongues. This was performed to intimidate the enemy and indicate that their flesh will be eaten when they are defeated. As we waited for the start of the ceremony with my group of fellow tourists, a volunteer was called for. I volunteered, and found out after that I had volunteered to be chief of my tribe, the Tribe of 15 Nations (we hailed from 15 countries). I was part of the ceremony and got to witness the chief approach me in quite an intimidating fashion with glaring eyes and swinging spear. Then he offered me a fern as a sign of peace. It is difficult to describe, but it was a powerful experience to maintain eye contact with a descendant of Maori chiefs. I also uncovered the hangi, which is the traditional Maori meal cooked in the ground. 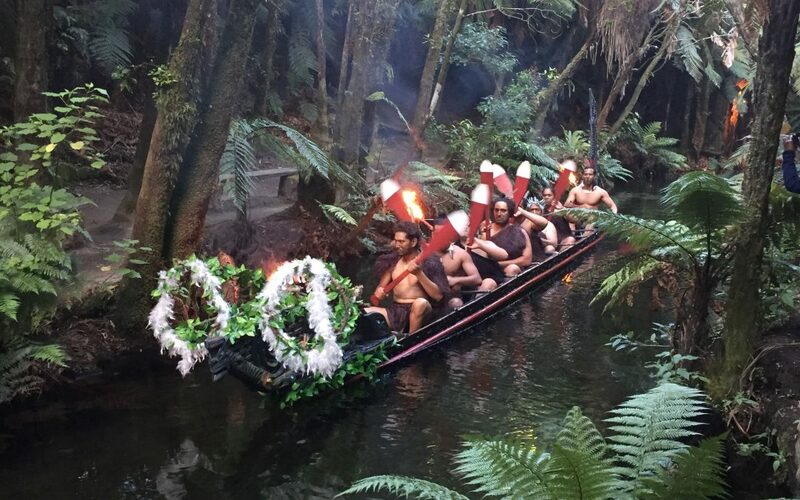 The experience included a presentation of performers in a waka, war canoe in the beautiful Rainbow Spring, which is a geothermal spring that is actually relatively cold. There were also demonstrations of the different weapons and traditional instruments. 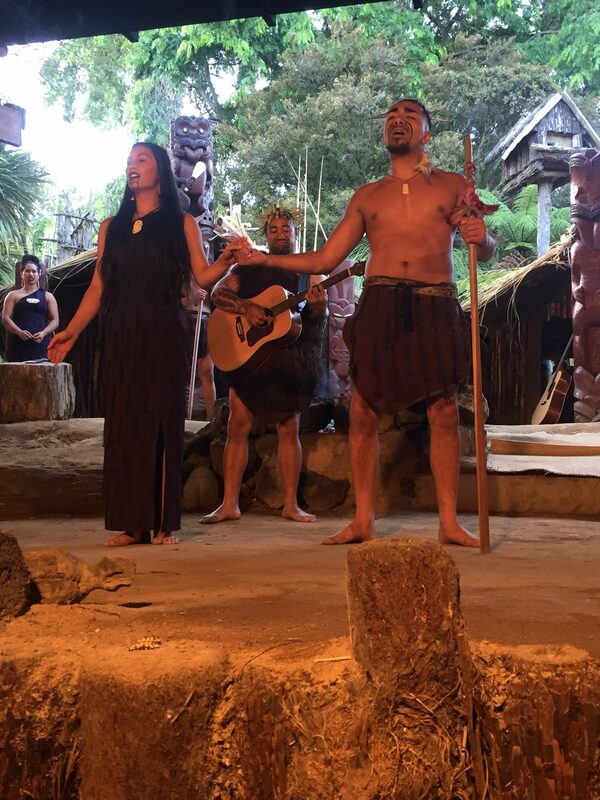 One nontraditional instrument which has forged its way into Maori song is the acoustic guitar and I enjoyed the live performances and dancing. We also learned the meaning of Maori face tattooing, which features designs representing various species of birds. At night we could see glow worms throughout the forest. I inquired about traditional Maori medicine, and received quite a detailed response. Manuka deserves particular mention. It is a type of honey unique to New Zealand. It is has been long used by the Maori for treating a wide range of diseases. It does have anti-bacterial properties and is being extensively studied. The kawa kawa is used for its numbing properties. Amakuchi is used to stabilize blood sugars in diabetics. The next evening I went to Ogo Zorb. Zorbing is the sport of trapping oneself in a clear ball and rolling down a long hill. Ogo Zorb claims the longest hill. The inner chamber is filled partially with water. I have a bit of claustrophobia, but I’m glad I pushed myself to do this. It was an absolute thrill. And I will never have another experience quite like that where I’ll feel like I’m inside an eyeball. On my last day of clinic, I brought in my guitar and played for the wonderful staff who were so accommodating for me. I left my CD. A tragic underpayment in my opinion for the hospitality and teaching. But I have resolved to pay it forward in the future, if the USA still appeals to young doctors abroad in the future. Saturday was my last full day in Rotorua. I took a bus to town and rented a mountain bike. Then I biked along the Sulphur Flats, a geothermal region that looks like the surface of the moon except for the billowing hot steam and rocks are hot enough to melt your shoes (or bike tires) should you stray too far off the path. 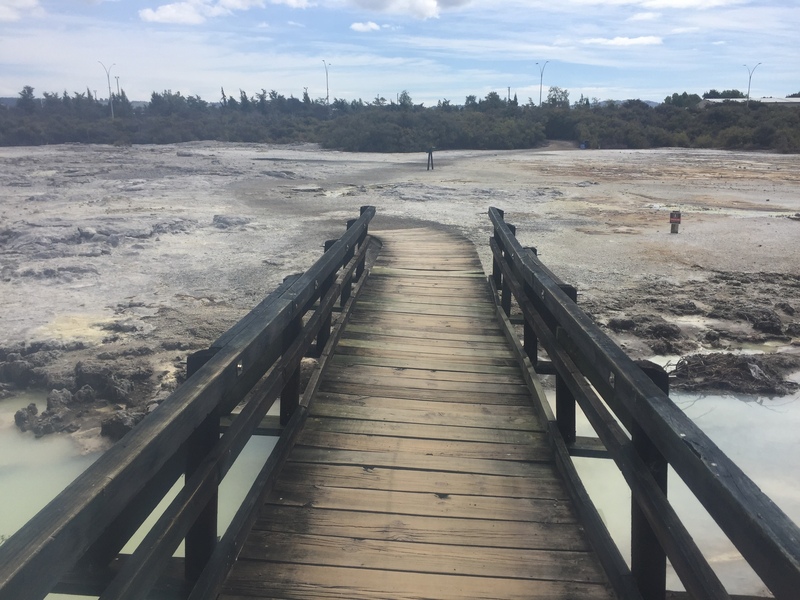 I made my way to Te Puia, a partially man-made geyser. I took the local advice and avoided paying the hefty fee to get in and found the described hole in the fence by the hotel nearby where I was afforded a great view of the partially man-made geyser. 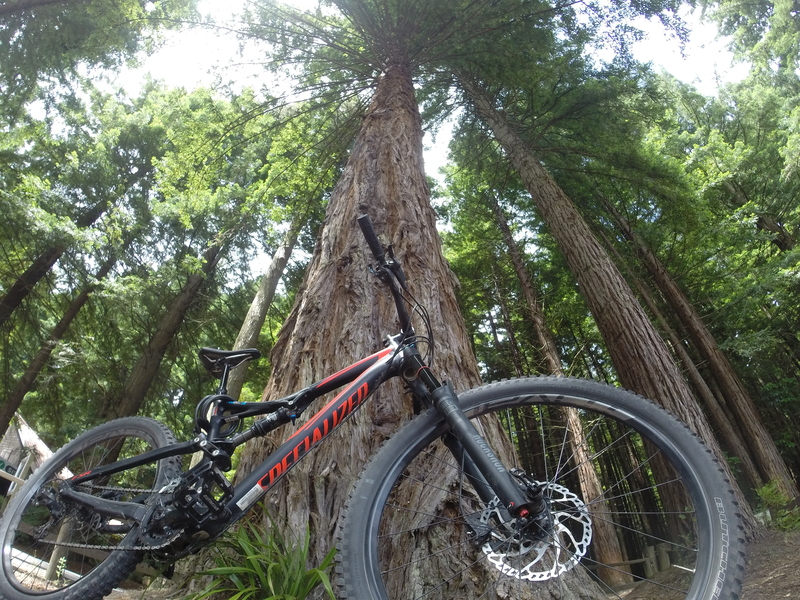 I then biked to Whakarewarewa Forest, the Redwoods, known as one of the best mountain biking locations in the world. The redwoods are non-native, brought in from California, but that doesn’t make them any less impressive. The location was a Maori pa or village, originally. A large portion of the native forest was destroyed by the eruption of Mt. Tarawera in 1886. The government started the first nursery in 1898 using seeds imported on ships from around the world. The first Redwoods were planted in 1901. The forest became a memorial to soldiers of WWI in 1925. Now the park is one of the most popular in New Zealand and is also home to some of the best mountain biking in the world. The climbs were steep but I had the time of my life. I had mountain biked once before last year in the Colorado Rockies. I took an intermediate track and felt my spirit fly. I flew once, over my handlebars into the dirt, and surprisingly only sustained some bruises and cuts. I did a couple more tracks and headed back to town. I biked through the beautiful Government Gardens. After returning my bike, I spent some time in the famed healing springs and slept very well that night. I will end this blog post by quoting the final page of Legends of Rotorua.